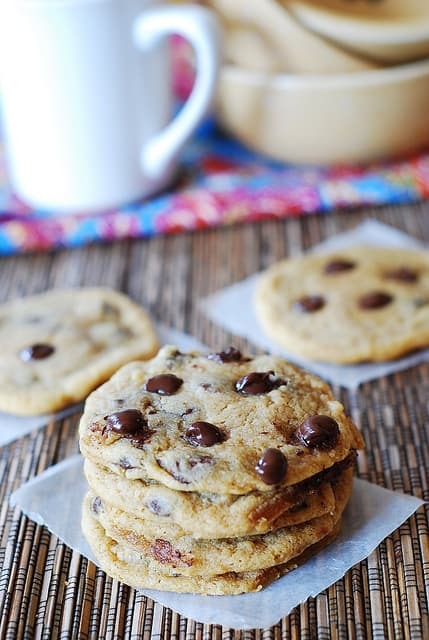 These soft and chewy chocolate chip cookies were gone quicker than it took me to blink! I had to make a second batch, then the third one – all within the same week! This recipe is a keeper! I also address common issues that you might have making cookies and tell you how to fix them, such as these: 1) The cookies spread out too much because the cookie batter is too liquidy or 2) The cookies don’t flatten/spread. 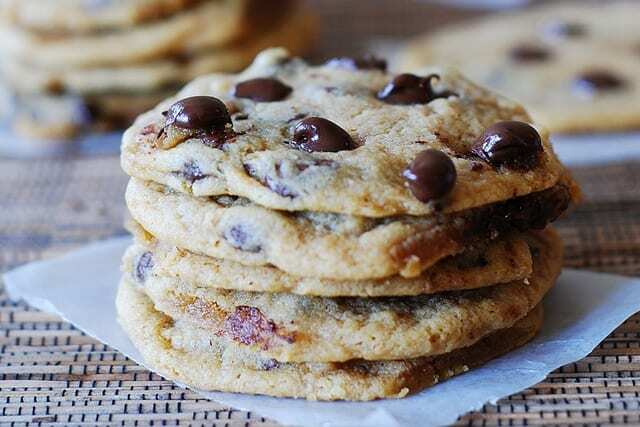 This is my favorite recipe for soft and chewy chocolate chip cookies, and it takes only 15 minutes to prepare these, plus 8 minutes of baking time. 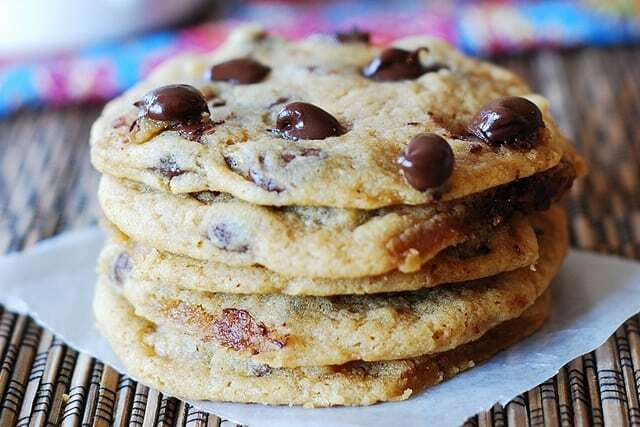 Easy, simple, classic chocolate chip cookies. They are soft and chewy on the inside and crispy on the outside. If that’s what you’re looking for – that’s the right recipe! 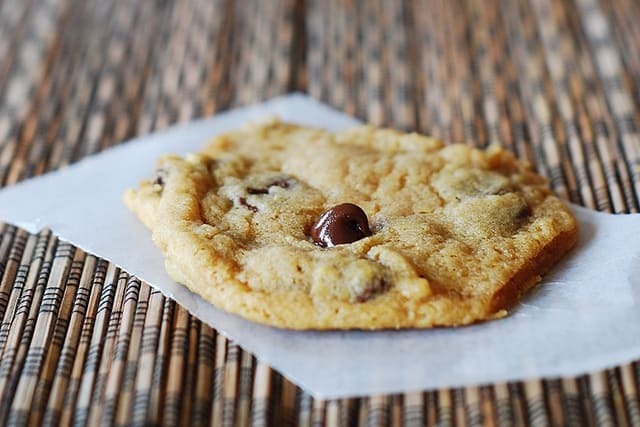 If you love soft and chewy chocolate chip cookies, then that’s exactly what this recipe delivers (just make sure not to over bake them). You’ll also love the simplicity – there is no need to spend more than 15 minutes on these cookies. Just keep in mind that it only takes about 8 minutes to bake these in a preheated 350-degrees-hot oven, and, when you remove cookies from the oven, they will still look somewhat uncooked in the middle (they will look cooked and set only around the edges). That’s what we want! Cookies will continue to cook while they cool on a wire rack (not on a hot baking sheet! ), and, once they have cooled off completely, they will look cooked and not at all liquidy in the middle. The cookies spread out too much forming one giant cookie: cookie batter is too liquidy. That will happen if you melt the butter in the microwave instead of letting the refrigerated butter sit on the counter for an hour or so to soften naturally and not become liquidy. The cookies don’t flatten/spread. That happens if you measured flour incorrectly, packing too much flour into a measuring cup. Do not overpack flour into measuring cup, fluff it up or use scale. It can also happen if you did not allow butter soften enough at room temperature and your butter is too cold. Allow the refrigerated butter soften at room temperature for an hour or so. The recipe makes 3 dozens of cookies. You can easily half the recipe. Store cookies in an airtight container at room temperature up to 1 week. 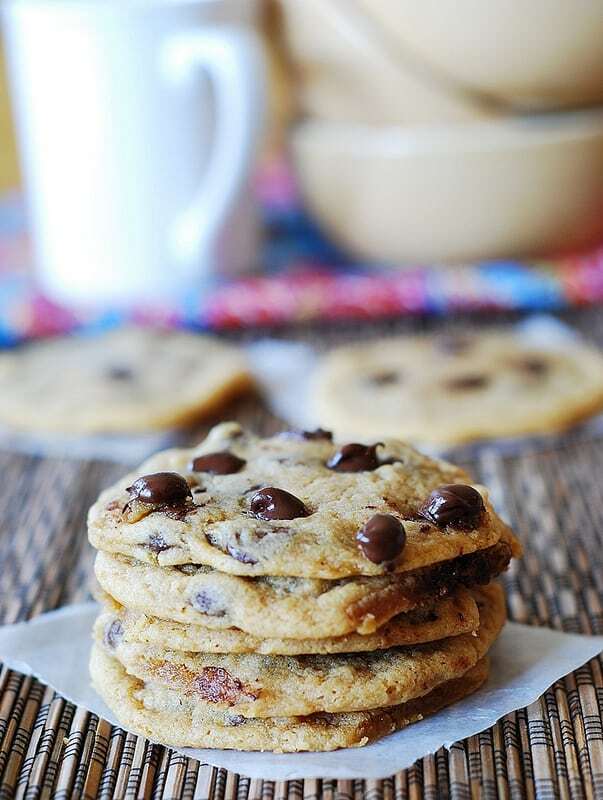 Easy, simple, classic chocolate chip cookies. 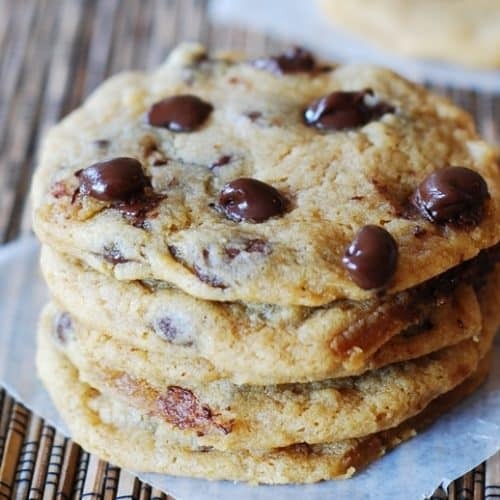 If you like soft and chewy chocolate chip cookies, make these! It takes only 15 minutes to prepare these chocolate chip cookies, plus 8 minutes of baking time. Using electric mixer, in a separate bowl combine the butter with both sugars. (The butter should be soft at room temperature, but it should not be liquid – do not use microwave). Beat butter and sugars on medium speed until light and fluffy. Add the salt, vanilla, and eggs and continue beating on low speed. Beat until mixture is light, fluffy and very creamy, about 1 minute. Add flour mixture; mix until just combined: do not overmix. Stir in the chocolate chips. Form tablespoon-size balls of cookie dough and drop them on baking sheets lined with parchment paper, about 2 inches apart. Bake until cookies are golden and set around the edges, but still soft in the center, 8 to 10 minutes. The softer you want your cookies to be, the less amount of time you should bake, that is, no more than 8 minutes. Cookies will still look like they are not set in the middle – that’s OK. They should not be golden brown on top. Once removed from the oven, they will continue cooking for a little bit. Remove from oven, and let them cool on baking sheet 1 to 2 minutes. Cut cookies if they’ve merged. Transfer to a wire rack or a sheet of foil, and let cool completely. Mine looked nothing like that 🙁 and I followed the recipe to a T! I only baked them for 8-9 min but they never spread out like yours on the picture they stayed chunky but they tasted good on the plus side! My cookies weren’t really flat at all and the 3 dozen?? Ha! I made 4.5 dozen with the ingredients as followed in the recipe. These looked so beautiful and perfect I had to try your recipe. Sorry to say the first batch came out undercooked and thin; the second batch I left in for 9 minutes which fixed the undercooking and the were more puffy until they cooled and then they went flat; the third batch I added a Tablespoon of flour. They are better but still too thin. Humidity? It is raining and I read something about baking on humid days but I thought it was for bread baking. I’m not giving up on this recipe. They are so close to the texture I’ve been looking for in CC’s. Thank you for sharing it gave me the inspiration to bake. These cookies are pretty flat by nature and very chewy – which is what I like about them. But they shouldn’t be as flat as you’re describing them – they should be flat like they are on my photos. Did you melt the butter in the microwave or just let it soften it on the counter naturally for 1 hour maximum? If the cookies spread out too much forming one giant cookie, it usually means cookie batter is too liquidy. That will happen if you melt the butter in the microwave instead of letting the refrigerated butter sit on the counter for an hour or so to soften naturally. Butter should not become liquidy. Another solution would be to put cookie batter in the freezer for 15-20 minutes and then form the cookies on the baking sheet. BEST cookies I´ve ever had! 🙂 thanks for this recipe. Bea, thank you! I am glad you liked the cookies! I have been searching high and low for a recipe as good as this – I added in smarties as well as chocolate chips and this made them even better! Hello. Pictures look nice. I am trying to translate the recipe into metrics, to use it in Finland. And have a couple of questions: English or American cups? I am going to try American, hopefully I am right. 350 degrees of what unit? 350 degrees F= 177 degrees C? Units (and country) are important online. Yes, American cups – I have actually all ingredients listed in grams under ingredient section. For example, it says right under ingredient list to use 270 grams all-purpose flour, etc. – does that work for you? Baked at 350 degrees Fahrenheit. I was reading the comments and in the ingredient list you mention 500 grams all-purpose flour, but in the comment you mention 270 grams. Which is the right amount? 2 1/4 cups of flour equals 270 grams. Thank you for bringing this to my attention. I have corrected the recipe.